A Christmas Train of Lights in 2006. The Niles Canyon Railway is a heritage railway running through Niles Canyon, from Sunol to Fremont in the East Bay of the San Francisco Bay Area, in California, USA. It restores and operates historic railroad equipment, and runs tourist excursions with both steam and diesel locomotives along its track. The Niles Canyon Railway operates along a former Southern Pacific Railroad right-of-way from Oakland to Tracy. Southern Pacific abandoned its operations through the canyon in 1984, and deeded the land to Alameda County. 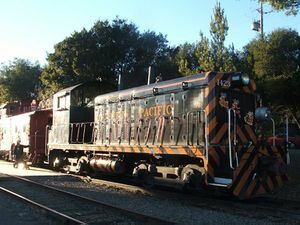 The Pacific Locomotive Association began working to restore the track in 1987, and the Niles Canyon Railway ran its first passenger train along the line on May 21 1988. Since that time, the organization has worked to extend and expand the amount of track along the line, and restore its increasing collection of locomotives and other railroad equipment. museum for the benefit of the general public. The railway runs tourist excursions on Sundays year-round, usually every week during the summer and less frequently during the winter. Several trips are run, generally alternating between steam locomotives and diesel locomotives, with both open and enclosed passenger cars. 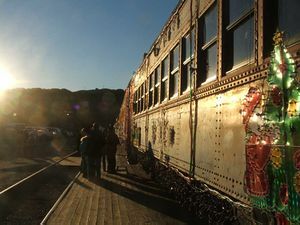 Group charters are also available, from a single caboose to an entire train. During the Christmas period, special "Train of Lights" trips run. At the western end of the line in Fremont, the Niles Depot Museum displays railroad artifacts owned by the Pacific Locomotive Association. Future plans for restoration of the historic Sunol Depot also include interpretive educational displays. The Pacific Locomotive Association has 10 steam and 13 diesel locomotives, and over 40 other pieces of rolling stock. This page was last edited on 15 February 2007, at 23:57.